To mark the 100th anniversary of Poland’s regained independence, the National Museum in Wrocław has prepared a special display of “Polonia” painted by Jan Styka. This large scale canvas has not been shown in Wrocław for many years. Just as many other works in the Wrocław collection it has its origin in the historic Eastern Borderlands of Poland, called “Kresy”, and encapsulates their myth. The canvas by the co-creator of “The Panorama of the Battle of Racławice” was painted to commemorate the 100th anniversary of the declaration of the Constitution of May 3rd which was celebrated in the then Lwów in 1891. 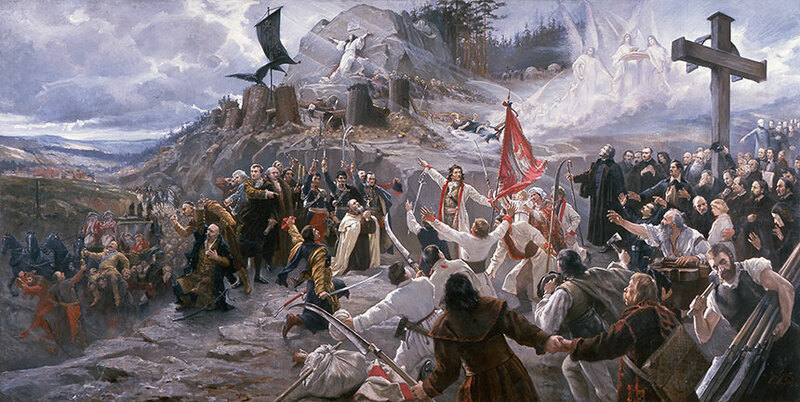 These celebrations were intended as the public and spectacular manifestation of Polish identity, and the exhibited picture of “Polonia” by Jan Styka was their highlight. The central figure of the composition is Tadeusz Kościuszko depicted in a peasant cloak which he put on as a symbolic tribute to the peasant participation at the end of the victorious battle of Racławice. Another significant figure is that of Adam Mickiewicz depicted in front of the spiritual leaders of the nation, the prophets and the artists, gathered around the cross.